Charm got three Finalist Awards in Children Animals, Non-Fiction Animals and Non-Fiction Short story in the 2014 Readers Favorite. It won 2014 Readers Favorite Honorable Mention in Non-Fiction Short Story. Charm has been awarded a Honorable mention in Non-Fiction Animals category in 2015 Readers Favorite International Book Awards! My hobbies include archeology, paleontology, history, tennis and fitness. Leyla Atke's Charm: An Amazing Story of a Little Black Cat is a lovely and evocative tribute to a beloved pet. The story is beautifully told, and the illustrations are masterful; sometimes primitive, sometimes very reminiscent of folk art, but always very powerful. Memoirs of this type can be overblown and excessively sentimental; however, Atke's narrative remains clear and calm, and engaged this reader from the first lines to the concluding words. Atke shows her gift of being first and foremost a storyteller. Her words and art are simple yet imbued with love and expression. This is a special book, and one I would not hesitate to recommend to those who are privileged to share their lives with animal companions as well as those who haven't been...yet. It's really quite a remarkable work and a story I won't be forgetting any time soon. 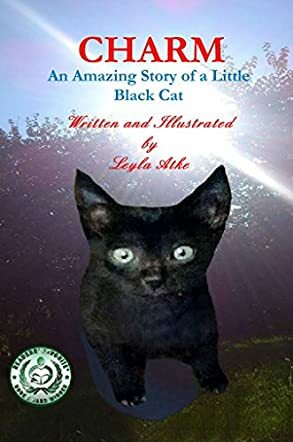 Charm: An Amazing Story of a Little Black Cat by Leyla Atke is a true story of the author's pet. She speaks about how she found her black cat abandoned on an intersection divider of a busy lane and brought it home. The book describes the trauma the author undergoes when Charm disappears and she finally finds its remains in a deserted factory playground. She comes to terms with her grief and buries her favorite pet. The twist is when a black kitten appears on the exact spot where Charm is buried. The author adopts that kitten and names it Charm. The story is a heartwarming tale of the author's moments with Charm. All pet lovers will be able to relate to the author's emotions and love for the cat. The author takes you through a wide range of emotions: love, compassion, sorrow, empathy, grief, and distress. The book is an ideal story for children and the drawings and crayon colorings make it child-friendly. The aspect of death in the book might not be that ideal for small children but, to a certain extent, many parts of this book can be read out at bedtime for small children. The 'charm' of Charm remains in the reader's heart for a long time. The language and details are simple and easy for a child to read and understand. You need not be a cat lover to appreciate the story. It will appeal to any reader. It is a wonderful story. Perhaps miracles do happen. Leyla Atke describes her love for a rescued kitten in Charm: An Amazing Story Of a Little Black Cat. Leyla has a hair appointment when she is taking a break from her work in town. She spies a small, black spot in the middle of the street. For the moment, cars are not rushing by and she sees that the black spot is a helpless, black kitten. She takes the kitten out of harm's way and she gently cares for it. Much of the grime is washed away with a careful bath. The tiny, fur-ball of a kitten grows into a confident, panther-like cat with green eyes. One fateful day, the window frames of the family home are being replaced, and the black cat called Charm runs away. Perhaps Charm will be found, one way or the other. “Charm: An Amazing Story of a Little Black Cat” is a children’s book written and illustrated by Leyla Atke. The story begins with a little black cat caught in the cross hairs of dangerous traffic, when the author swoops in and saves his life. The author brings him home, names him Charm and bathes him carefully. Charm is a noble beauty with his black silky coat and bright turquoise green eyes. After a year and a half, the family starts renovations in their home and Charm goes missing amongst the chaos. Charm is found dead in a nearby location, but what comes next is enlightening and miraculous. I absolutely loved the concept and the plot. The illustrations were done in crayon and it looks as if they were done by a child. I liked the concept of the illustrations, especially if they were done by a child. I liked the photos of the black kitten at the end of the story. I think this is a great children’s story. The plot is well-organized and well-thought out. I liked the full circle range of emotions in this story from empathy, compassion, happiness, love, distress, grief and then to happiness and love again. This is a delightful and inspiring children’s story. Wonderful little book of an uncanny tale. Leyla Atke shares a true story that you can tell she is compelled to tell because it is so filled with charm and magic. After reading this lovingly written book with its fanciful illustrations I couldn't get the story out of my head. The extraordinary other-worldliness of it made me wonder and reflect: what is life and what of it do we know. You'll like this book and will be compelled to share the story yourself! Nice.